U.S. Paralympic snowboarder and inventor Mike Schultz in his St. Cloud, Minn., office, showing off the prosthetic sports leg he invented in 2009. The Moto Knee costs about $6,000; the Versa Foot is around $2,400. It's estimated 30 athletes will use the devices at the Paralympics in South Korea. 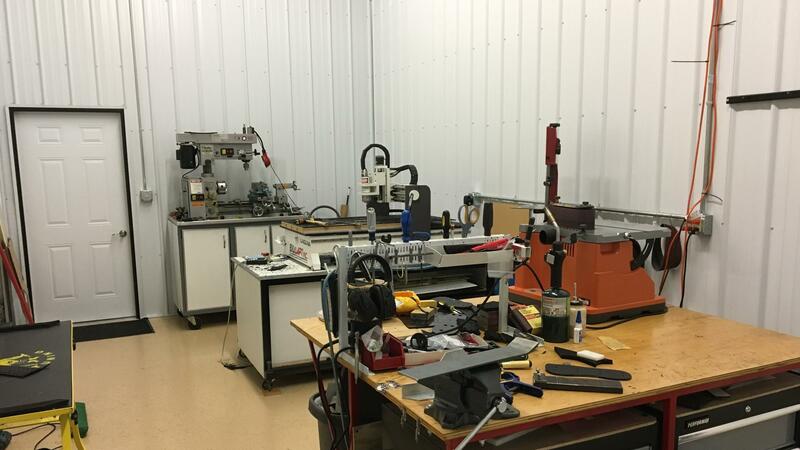 One of several machine shops Mike Schultz uses to make his special prosthetic sports leg — a unit that includes the Moto Knee and the Vera Foot. Schultz, a U.S. snowboarder competing at the Paralympics in South Korea, invented the devices after losing his leg in a snowmobile race accident in 2008. 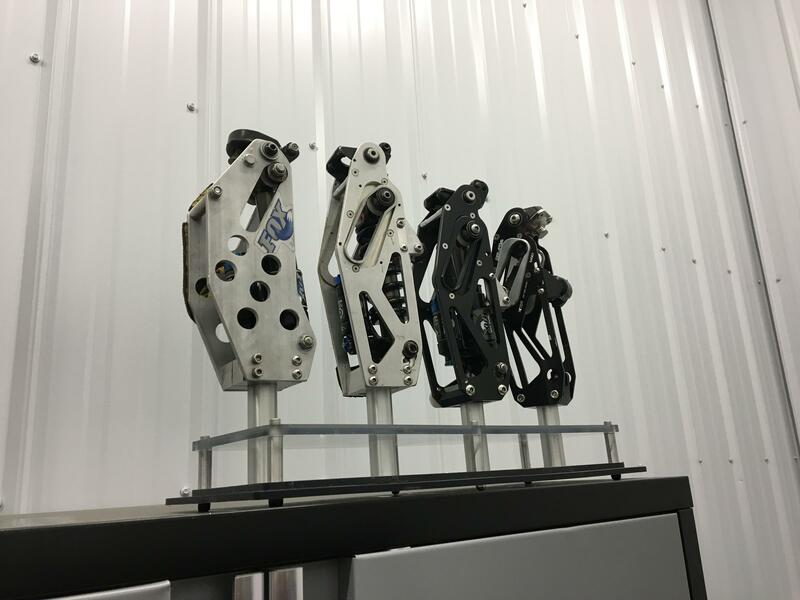 Some of the early versions of the Moto Knee on display in one of Mike Schultz's work rooms. The part, used in a prosthetic sports leg, is based on a mountain bike shock absorber. 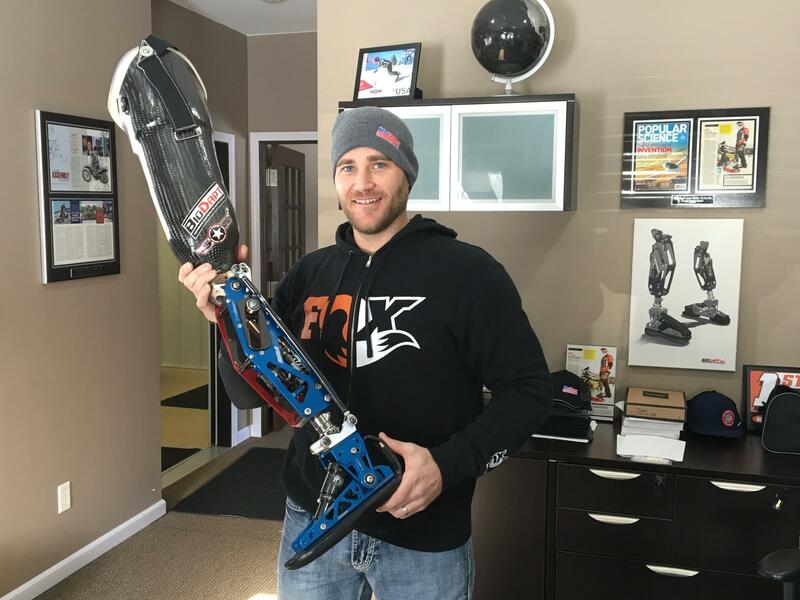 Schultz, a U.S. Paralympic snowboarder, invented the Moto Knee, as well as the Versa Foot, after his leg was amputated following a snowmobile race accident in 2008. U.S. snowboarder Mike Schultz has a story that's hard to beat. He's competing in his first Paralympics, and helping others compete as well. In his understated, Minnesota kind of way, St. Cloud resident Mike Schultz recounts the day he nearly died. "December 13th, 2008," he says. "That kind of changed everything a little bit." At the time Schultz was a top professional snowmobile racer, nicknamed Monster Mike. On that December day, he was in a race in Ironwood, Mich., on the western end of the Upper Peninsula. It was cloudy and the light was flat, making it hard to see the terrain. As Schultz went to pass a competitor, he lost control and got bucked off his machine. "I landed on my left leg with all my weight," he recalls, and the leg hyperextended at a horrifying angle. "It totally bent the wrong way. I kicked myself in the chin with my toe." He senses his visitor's discomfort. "Yeah, not a great picture," he says. The accident shattered his knee and severed an artery. Because of bad weather a helicopter couldn't whisk him to the nearest hospital, so Schultz --with his wife Sara, a nurse, riding along — had to endure a 2.5-hour ambulance ride to a trauma center in Duluth, Minn.
During the ride, Schultz says, the EMTs had a hard time stopping his bleeding. "I basically bled out," he says. "There was very little blood left in me. [It was] kind of amazing that I survived that part of it." When he finally got to the hospital, blood loss and other complications forced doctors to take drastic action: They amputated his left leg 3 inches above the knee. Schultz, who was 27 years old at the time of his accident, had raced snowmobiles and dirt bikes since he was a teenager. Now he had to face life without them. He got a prosthetic leg to walk on. It was very basic, with a mechanical hinge in the knee. But Schultz had bigger plans. He heard about motocross racing in the X Games for amputees, but knew he wouldn't be able to compete wearing his klunky prosthetic walking leg. A self-described problem solver, Schultz also had natural mechanical skills. "A lot of the jobs I had revolved around metal fabrication, and creating and building and maintaining equipment," he says. "Then, through my racing career, I was always intrigued by the suspension components — the shocks and suspension of the [snowmobiles] and dirt bikes. Also, working with physical trainers and understanding body mechanics — these experiences through my life allowed me to look at this mechanically and understand, 'all right, I need to build a suspension component for my leg to absorb impacts of the jumps.' "
Or, as he described in a 2016 appearance on 'Conan', "I was in the garage fixin' things and I'm like, what better project than building your own leg?" Before building a leg, Schultz had to sketch it out. "It took about a month drawing the designs and getting the geometry just right," he says. "[Then] I went into the shop and started cutting parts. It took me about a week in the shop to get all the pieces built and milled out and turned on the lathe." He ended up with a leg built specifically for sport. "I revolved the whole design around a mountain bike shock," he says, "using compressed air as a spring rate so I can adjust it. I finally get it all put together and bolted to my socket, my leg, and get on the dirt bike for the first time. And within a minute, I knew this was going to allow me to ride again. I felt balance side-to-side, I could stand up, sit down, and I could go over rough terrain — and it was like 'oh yeah, we're gonna go racin' again!' "
Seven months after his injury, Schultz, using his new sports prosthesis, won an X Games silver medal in the adaptive motocross event. Then in 2010, he started his company Biodapt, and made his inventions available to other athletes with disabilities — including fellow U.S. snowboarder Keith Deutsch. "It just felt like my leg"
Retired Army Sgt. Keith Deutsch lost a leg in 2003 while serving in Iraq. He had been a snowboarding instructor and had raced in the sport before he went into the service. In early 2011, Deutsch was in Colorado for a national para-snowboard competition, and so was Schultz. The two men met, and Schultz suggested Deutsch try the Moto Knee. "It just felt like my leg," Deutsch says, recalling the first time he wore the device. "I could stand up, I could bend all the way down to sit on my heels, with my knees up to my chest." Deutsch says the Moto Knee was leaps and bounds beyond anything else he'd ever tried. He was overjoyed. Schultz says Deutsch's reaction was "memorable." Their connection went beyond businessman and client: Deutsch got Schultz on a snowboard for the first time. "I think he was jealous of me going so fast," Deutsch laughs. Schultz took some runs — not perfect, but Deutsch could tell Schultz had natural ability. "He's a born, bred racer," Deutsch says. "I mean [he] sees the race line when he looks at a track. He's not afraid of going fast and he picked it up really quickly. The guy's in the [Paralympics] 3, 4, 6 years after he started?" Certainly it hasn't been a straight line from those first snowboard runs in Colorado to qualifying for the Paralympics. Schultz says he's spent a good deal of time on his backside and wrists, like all those who learn to snowboard. But he's gotten to the point where he proudly shows off the fruits of his hard labor: A trophy case filled with recent snowboarding awards. "Down in New Zealand I ended up getting a silver [medal] in banked slalom and then we went to Europe, the Netherlands, where I got a silver and gold," he says. "Then I went up to the north side of the world, in northern Finland and got a couple of gold's up there. So it's been a phenomenal season so far. At this point I'm leading the world in points for banked slalom and bordercross events." Those are the two para-snowboard events being contested in South Korea. Schultz's trophy case is one of several in a small, well-equipped gym next door to his office. He works out there four to five days a week, lifting weights, working on a balance board — balance is key in snowboarding — and using resistance bands. The gym, his office, and several rooms with machinery for making prosthetic legs are all in a large, converted storage shed next to the house in St. Cloud that he shares with Sara and their young daughter. One takes all this in — his growing business, his sudden success in snowboarding — and you wonder, was that horrible day in 2008 actually a good thing? "Not a day goes by in my life where I don't wish I could have my leg back," Schultz says. "I wish I could grow my leg back today." In fact, life since December 2008 has been a rollercoaster for Mike Schultz. He says all the success has been hard-earned, with a lot of failures along the way. "On the mechanical side of things," he says, "I've spent a lot of time and money on things that didn't work. I've got a drawer full of pages and pages and pages of designs, and I've got a whole lot of receipts of money spent on stuff that didn't make it anywhere." Some of the hardest challenges are the everyday things. "I love being outdoors and trekking around," he says. "I loved to go hunting out in the woods and hiking and that's just not easy anymore. For me to walk up and down hills in the rough terrain, it just doesn't work very well. It can, but it's three times as hard as it used to be." And Schultz tears up talking about private, scary moments he had when his daughter was born. "I couldn't carry her around at night, because I didn't have my leg on. [In two instances] I was carrying her in our bedroom and I tripped. And I had to chuck her across the room so she could land on the bed. And those are the moments that are real — I can't carry my daughter without worrying about tripping, possibly injuring her." Friday, the public Mike Schultz will be on full display. He's been chosen to carry the flag and lead the U.S. delegation at the Paralympics Opening Ceremony. "For me to be that guy [carrying the flag] for 2018 is an incredible honor," Schultz said in a statement. "I'm so excited and humbled that my snowboarding team and our U.S. delegation voted me to be that person." Perhaps it's a bit of payback. According to The Associated Press, there will be around 30 athletes from six different countries at the Games using the Moto Knee, Versa Foot or both. That includes one of his main competitors in snowboard, U.S. teammate Noah Elliott. "He beat me in our last competition," Schultz said in January, "and I beat him in a couple of competitions before that. He's missing his left leg above the knee just like me, and I sent him a Moto Knee and Versa Foot a little over a year ago. And now he beat me twice this year!" With Paralympic medals now on the line, Schultz says that aiding his rival is something he thinks about. "But y'know, whether he wins or I win, it's still a win for me," Schultz says. "In the big picture, it's great for my company and it's great for my story as well." Schultz and other para-athletes say there's a lot more camaraderie in their ranks than among the more cutthroat professionals. Still, Schultz acknowledges everyone's a competitor and they want to win. Then he grins and says, "Maybe I'll have to do an equipment recall right before the games. Like 'hey Noah, I'm sorry but you need to send your leg in for service work!' "
Schultz better hurry: The first Paralympic snowboard competition is Monday in Pyeongchang, South Korea. Tomorrow the Winter Paralympic Games begin a 10-day run in South Korea featuring the world's best athletes with disabilities. U.S. snowboarder Mike Schultz is a medal contender competing in his first Paralympics. And as NPR's Tom Goldman reports, Schultz is helping others compete as well. TOM GOLDMAN, BYLINE: Close to 700 athletes are gathered in Pyeongchang for the Paralympics. They'll take part in six sports, including alpine skiing, biathlon and snowboarding. Most of these athletes have dramatic stories to tell. Mike Schultz has one that's hard to beat. MIKE SCHULTZ: December 13, 2008 - yeah, that kind of changed everything a little bit. GOLDMAN: Schultz, in his understated Minnesota kind of way, recounts the day he nearly died. He was at the time a top pro snowmobile racer nicknamed Monster Mike. But on that day at a race in Michigan, Schultz got bucked off his machine. SCHULTZ: I landed on my left leg with all my weight. GOLDMAN: The leg hyperextended at a horrifying angle. SCHULTZ: Totally bent the wrong way. I kicked myself in the chin with my toe. GOLDMAN: The accident severed an artery, and he nearly bled to death. Doctors had to amputate his left leg 3 inches above the knee. Mike Schultz had raced snowmobiles and dirt bikes since he was a teenager. Despite his injury, he wasn't ready to give them up. But he knew he couldn't get back to his beloved sports with his basic and clunky prosthetic walking leg. SCHULTZ: Yeah, here's the original drawings for the Versa Foot. GOLDMAN: Schultz shows off the beginnings of what would end up changing his life and others, as he recounted in a 2016 appearance on "Conan." CONAN O'BRIEN: You're certainly motivated. SCHULTZ: I was very, very motivated. GOLDMAN: He built a leg specifically for sport. The Versa Foot and Moto Knee gave Schultz all-important shock absorption and range of motion. Seven months after his injury, he won an X Games silver medal. In 2010, he started his company BioDapt to make his inventions available to other athletes, like Keith Deutsch. SCHULTZ: For the purpose of this conversation, Sergeant retired Keith Deutsch. GOLDMAN: Deutsch lost a leg in 2003 serving in Iraq. He'd been a snowboard instructor and raced in the sport. In 2011, in Colorado, he met Schultz, who lent him the Moto Knee to try. KEITH DEUTSCH: It's the most familiar I've felt since I lost my leg. GOLDMAN: Deutsch was joyous. Schultz says giving Deutsch that moment was strong stuff. Their connection was significant for another reason. It got Schultz on a snowboard for the first time. DEUTSCH: He's not afraid of going fast. And he picked it up really quickly. The guys in the Olympics - what? - three, four, six years after he started. GOLDMAN: Seven to be exact. SCHULTZ: So I'm balancing on a round peg underneath the board. I've got a 12-pound medicine ball bouncing on the ground. GOLDMAN: Schultz works out in a small gym adjacent to his office. It's all part of a large converted storage shed where Schultz also makes his prosthetic devices. The shed is next to the house in St. Cloud that he shares with his wife and young daughter. One takes it all in - his business, his success in snowboarding - and you wonder. Was that horrible day in 2008 actually a good thing? SCHULTZ: Not a day goes by my life where I don't wish I could have my leg back. I wish I could grow my leg back today. GOLDMAN: Schultz says all the success has been hard earned, and there have been failures along the way. And there are things people don't see, like the time he was carrying his infant daughter at night and not wearing his prosthetic leg. SCHULTZ: I tripped. And I had to chuck her across the room so she could land on the bed. Those are the moments I - that are real, you know? I can't carry my daughter around without worrying about tripping, possibly injuring her. GOLDMAN: Tomorrow, the public Mike Schultz will be on full display. He's been chosen to carry the flag and lead the U.S. delegation at the Paralympics opening ceremony. Tom Goldman, NPR News. Transcript provided by NPR, Copyright NPR.